Extreme weather, characterized by severe cold spells and heavy rains, have wrought havoc in parts of South Africa, leaving six people dead, authorities said on Monday. Four people died due to extreme weather that has hit the Western Cape since Friday, according to the provincial Disaster Management. Meanwhile, two people were believed to have died of exposure to cold in the Eastern Cape Province, police said. In Western Cape, an estimated 30,000 people have been affected by the extreme weather, said Colin Deiner of the Disaster Management. “We’re doing a periodic update of what requirements there are and where we should assist in response to these incidents,” said Deiner. In Cape Town which was hit by hail and thunderstorms at the weekend, 2,266 people were affected by floods and hundreds of houses were damaged, according to the city’s disaster management’s Wilfred Solomons-Johannes. The South African Weather Service forecast snow for mountains in the Southern Cape and biting cold for the rest of the week. PASSAU, Germany (AP) — Swollen rivers gushed into the old section of Passau in southeast Germany on Monday, as water rose in the city to levels not seen in more than five centuries. The city was one of the worst hit by flooding that has spread across a large area of central Europe following heavy rainfall in recent days. At least eight people were reported to have died and nine were missing due to floods in Germany, Austria, Switzerland and the Czech Republic. “The situation is extremely dramatic,” Herbert Zillinger, a spokesman for Passau’s crisis center, told The Associated Press. Much of the city was inaccessible on foot and the electricity supply was shut down as a precaution, he said. Rescuers were using boats to evacuate residents from flooded parts of the city. Authorities in the afternoon evacuated a prison that was in danger of being flooded, moving 60 inmates to two other nearby facilities on higher ground. But with water from the Danube, Inn and Ilz rivers relentlessly pouring into the city, water was advancing into previously dry streets – in one case going from dry to ankle-deep within half an hour. Markers set in 1954, when the city suffered its worst flooding in living memory, have disappeared beneath the rising water. The German news agency dpa said the water levels were the highest recorded since 1501 in Passau, a city of 50,000 people that dates from before Roman times. 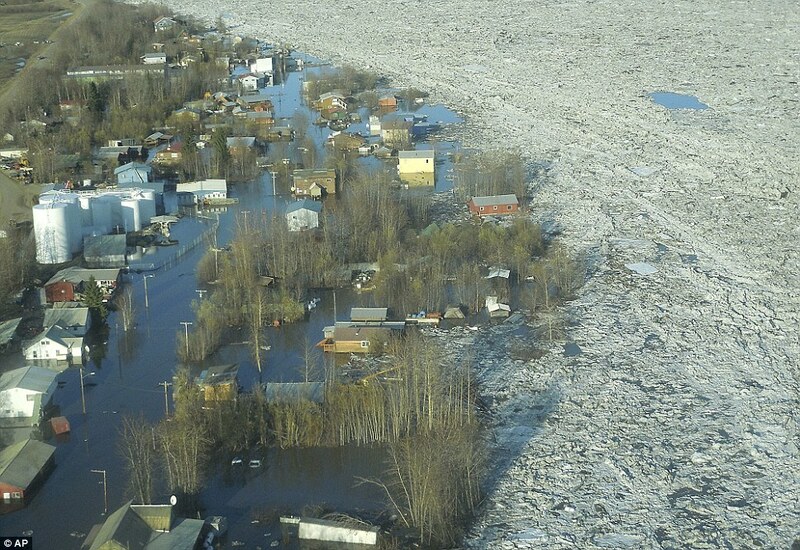 Thirty-mile long ice jam causes devastating floods in Alaskan town as hundreds of residents are forced to flee. A huge 30-mile block of ice his causing chaos in an Alaskan town as water has been flowing onto the land.The colossal river ice jam, which is when water builds up behind a block of ice, was starting to rotate Wednesday as water finally chewed ice chunks away from the stubborn, frozen mass after most of the residents were forced to flee from the rising water.An aerial survey Wednesday afternoon revealed chunks of ice have broken off at the front of the 30-mile ice jam on the Yukon River, National Weather Service hydrologist Ed Plumb said. That means the jam will move soon and waters will begin to recede in the waterlogged town of Galena, 20 miles upriver. The massive, magnitude-8.3 temblor that struck today (May 24) near Russia’s Kamchatka Peninsula could turn out be the deepest earthquake ever recorded. At 378 miles (609 kilometers) below the seafloor, the quake could best the previous record set in Bolivia, in 1994. The initial depth may be revised as scientists collect more data. The Bolivian quake was a magnitude-8.2, and 392 miles deep (631 km), Nature News reported. Why so deep? The Sea of Okhotsk sits above a subduction zone, where the Pacific Plate dives beneath the North America Plate. (Though some scientists think there is also a microplate, a small tectonic plate, beneath the sea.) The northwest Pacific crust is some of oldest, coldest oceanic crust subducting on Earth. It’s also quickly rolling into the subduction zone, like a speedy conveyor belt, so the cold crust reaches deep into Earth’s mantle before warming up. This setting makes for deep earthquakes in the subducted Pacific plate crust. The extraordinary depth of today’s earthquake also means the shaking traveled far across Russia, reaching Moscow and rattling the Kremlin 4,000 miles (6,400 km) away. The waves also crossed the United States, as seen in this video from the Incorporated Research Institutions for Seismology. As painfully obvious from the recent events in Oklahoma, tornado season is in full gear. Meanwhile, hurricane season is a week away. Yet budget woes and multiple system failures at the National Weather Service in the past week, not to mention staffing shortages, are raising concerns that its ability to warn the public of hazardous weather could crack at any time. These problems are symptomatic of insufficient funding and dated infrastructure, advocates for more generous NWS budgets say. What follows is an overview of the problems NWS has encountered, just since Sunday. Late Monday evening, just hours after the Moore, Okla. tornado carved a deadly, 17-mile path, a Verizon telecommunications outage occurred at a facility outside Chicago, affecting 6 forecast offices according to Chris Vaccaro, a National Weather Service spokesperson. At the forecast office serving Chicago in Romeoville, Ill., when forecasters attempted to issue a severe thunderstorm and flash flood warning for the Windy City, systems went down. Forecasters were unable to disseminate the warnings according to Eugene Izzi, a forecaster at the office and also a representative of the National Weather Service Employees Organization (NWSEO), a labor union. “We and our neighboring offices lost internet and we were unable to transmit any products, we only received some limited data (our own radar, but no other sites) and we were essentially left crippled,” explained Izzi in a Facebook post. The Romeoville office contacted its secondary back-up office in Milwaukee and, over the phone, dictated the warning information. Dan Sobien, president of the NWSEO, questioned why there was no back-up. “If NWS has to rely on Verizon to get its warnings out, then it’s doing something wrong,” Sobien said. On Wednesday, the weather satellite that keeps an eye on the sky over much of eastern North America and the western Atlantic ceased operating. The satellite, known as GOES-13, had failed one time earlier last fall and was restored. As a temporary solution to the current outage, NOAA switched its other primary weather satellite, GOES-15, which focuses on the West Coast and parts of the Pacific, into “full-disc mode” to provide broader coverage and fill the gap left by GOES-13. But meteorologists warned the quality of the substitute imagery would be compromised due to the larger viewing angle. “The satellite coverage from GOES-15 results in distorted images of the eastern U.S. and the western Atlantic and would be a significant concern for forecasters and the public at large going into the Atlantic hurricane season,” wrote AccuWeather meteorologist Alex Sosnowski. NOAA said that a European satellite provides high quality substitute imagery in the gap region and it plans to turn on its backup satellite, GOES-14, today to resume dedicated coverage there. But if GOES-13 cannot be fixed and GOES-14 encounters technical difficulties, there is no backup (aside from relying on European data) until NOAA’s next generation weather satellite GOES-R is launched in 2015. And that launch has encountered delays. In February, the Government Accountability Office classified the possible satellite gap among the top 30 challenges facing the Federal Government. Since Wednesday evening, National Weather Service websites for the entire Southern Region have functioned only intermittently. This has limited public access to forecasts and warnings. The Southern Region covers a huge area from Florida to Oklahoma including areas under a heightened risk of severe weather today in Texas. Although the website operations have been spotty, the public can (and could) still access forecast and warnings for these areas from NWS’ main portal, weather.gov. We are awaiting word from the National Weather Service on the cause of the current problem and the status. Just hours before several tornadoes touched down in Oklahoma on Sunday, the Midland, Texas, an official at the National Weather Service forecast office turned down a voluntary opportunity to launch a midday weather balloon to sample atmospheric conditions, citing budget concerns. Morning and evening balloon launches are mandatory. Forecast offices may initiate “special” midday balloon launches when severe weather is expected in the region to provide additional data. Several offices in the Plains, including Norman, Okla., released special launches during the Sunday and Monday severe weather outbreaks, although Midland passed on the opportunity. “Given our budget (cough) situation, I’ll decline,” typed Brian Curran, Science Operations Officer at the Midland NWS office, into the agency’s internal chat system. Midland was not in an elevated risk zone for severe weather at the time. But Dan Sobien, president of the NWS Employees Organization, said he thought the data would have been a useful input to forecasts and that to decline the request was unusual. In addition to these budget and technology systems issues, forecast offices are short-staffed. There is a 10 percent vacancy rate within the NWS, and hiring is frozen as a cost savings measure motivated by the sequester. The Department of Commerce had also proposed four days furlough days for NWS forecasters, a move that was challenged by Congressman Frank Wolf (R-Va.) Wednesday. “The severe weather events in Oklahoma this week have further convinced me that we should not take any chance that avoidable furloughs might result in a degradation of weather prediction and forecasting services,” Wolf said in a letter to Rebecca Blank, acting secretary of the Department of Commerce. The NWS Employees Organization has persistently voiced objections about vacancy rates, the furlough plan, hiring freeze, tight forecast office budgets and aging technology infrastructure. Four Fireballs seen in U.S Skies in Last 24 Hours & Another Coming. 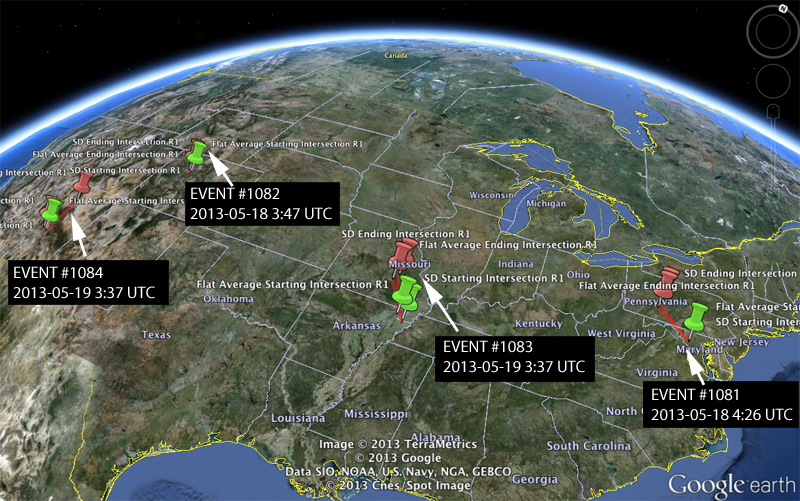 Comments Off on Four Fireballs seen in U.S Skies in Last 24 Hours & Another Coming. In case you weren’t sure what climate change looks like, here’s a preview: It looks like millions of people displaced from their homes due to flooding. For example, in 2012, when 32.4 million people had to leave their homes due to disaster, the majority of whom were displaced by flooding from monsoons and typhoons in Asia. The Norwegian Refugee Council operates the Internal Displacement Monitoring Centre, the focus of which is to track how and where such displacement occurs. Its estimates for 2012, released today, indicates that the year’s total comprises 22 percent of displacements since 2008. Sixty-eight percent of the displacement was as the result of what the IDMC calls a “mega event” — an event that displaces at least a million people. Ninety-eight percent of all displacement was due to climate- or weather-related events. Unusually, the United States was in the top ten countries affected, thanks largely to Hurricane Sandy. It’s often the case that those displaced are from the poorest countries in the world. And, indeed, 98 percent of those displaced in 2012 live in developing countries. The map below shows gross domestic product by country; the lighter the country, the lower its GDP (expressed in millions of US dollars). Mount Etna burst into life once more at the weekend as it shot lava, ash and smoke hundreds of feet into the air. Residents had been warned about the imminent eruption as grey smoke has been seen rising from the volcano for days. On Saturday, red hot lava was spat into the air as the volcano violently erupted once more.